Solid polycarbonate is a lightweight, durable and safe alternative to glass. It is for this reason that solid polycarbonate sheets are used on a huge variety of roofing projects. These include conservatories, carports, lean to's and much more. 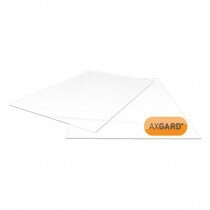 Our range of solid polycarbonate sheets are avaialble in a wide variety of colours and thicknesses. Our colour options include clear, black, opal and bronze. These roofing sheets are also available in a patterned option, which provides a greater level of privacy for your conservatory or extension. To ensure that you're able to find the perfect solid polycarbonate sheet for your project, we stock a vast selection of lengths and widths. So that you can order all of your supplies from a single supplier, we also stock the full range of compatible glazing bars. If you have questions about our solid polycarbonate, simply contact our team online or by telephone. We'll help you choose the ideal roofing supplies for your project and ensure you make big savings. With fast delivery across the UK, your solid polycarbonate will be on your doorstep within a few days.